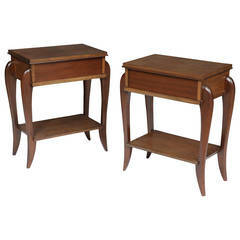 A pair of walnut bedside dressers or chests of drawers featuring a sculptural front with eight-drawers by Nancy Corzine, England, circa 2010. Dimensions: 36 inches L × 20 inches D x 27 inches H.
Newly lacquered, including inside of all drawers, in a lovely linen white, pair of bachelor chests nightstands dressers. Clean, modern look. In the style of John Stuart. Gorgeous tongue and groove two tone Danish style nightstand or small chest with three drawers made from gorgeous walnut with wonderful detailing.